Whilst out training on the Solent today, Land Rover BAR's test boat, T2, capsized off of Ryde, Isle of Wight. The boat was righted quickly and no team members were injured. However damage was sustained to a section of the wing. The team is currently assessing this, but plans to be back on the water in the New Year. 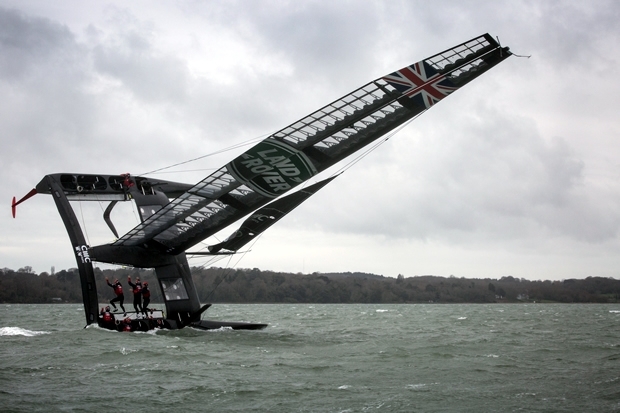 T2 is Land Rover BAR's second test boat, launched on 5 October. At the time of the incident, the wind range was 15–19 knots and the foiling catamaran was sailing at a slow speed when the wing inverting caused the boat to capsize to windward. Team members on-board: Ben Ainslie, Paul Campbell James, Bleddyn Mon, David Carr, Nick Hutton, Andy McLean and observer, Benjamin Muyl.